Halfway through! Yesterday I covered how my year has gone so far, the approach I’d taken to training around a heavy race load and how that would continue. Today I’m going down to the micro level to look at how I structure my week. There’s a link to Training Plans in the right hand column. I’ll confess now that it’s heavily outdated. The plans you see there were true during October and November last year. 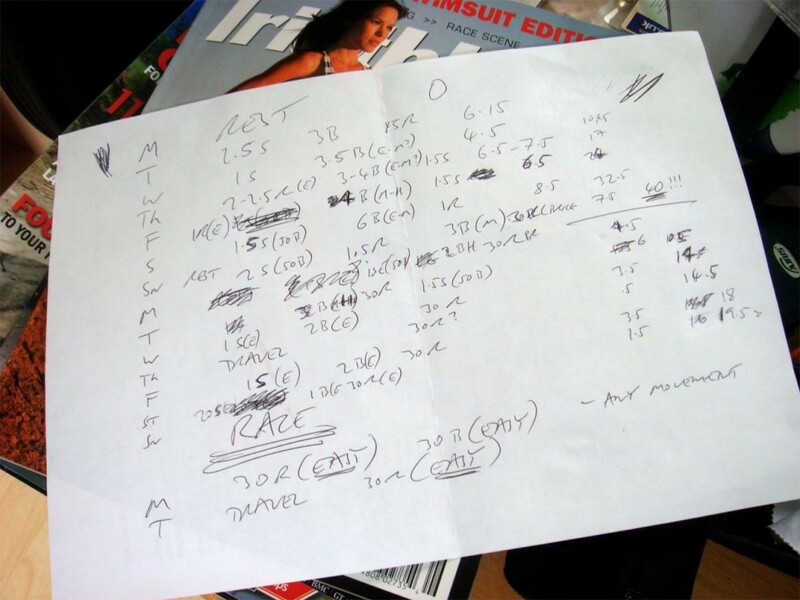 After Ironman Western Australia I was a little less strictly structured in my weekly plan. It’s a good guide to how I trained whilst in Oz though. In Lanzarote and since being home the exact structure is a little different. 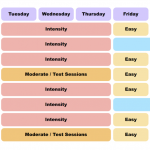 My weekly training structure is largely inspired by the principles of a basic week. The idea is pretty simple, probably why I’m drawn to it. The structure of my training week doesn’t vary much – I do the same type of training at similar sort of times. Part of the principle is that there’s a lot of endurance specific fitness to be gained from a simple consistent level of training. The most important aspect of the basic week is that it will always contain a certain set of key workouts. That is types of workouts such as a long endurance ride or a squad swim session. These key workouts are the backbone of my training. They’re the ones I don’t want to miss because they’re the biggest contributors to my adaptations. Around them are other sessions, less key, but still important. They help keep the volume up in each discipline and over time develop strength and fitness. The key sessions. I suppose the whole point of this post is to look at the key sessions and my reasoning behind them all. Generally my biggest priority each week is to maintain a high volume of cycling. A typical week contains in the region of 500km on the road. This is divided across all seven days. I rarely take a day off riding even if it’s just the commute to and from the lake. I’m a firm believer that bike fitness is the key to a successful Ironman. Not because you get a faster bike split, but because you can set a solid bike split and run well off it. If I ever doubted Lanzarote proved how devastating a poor run is to Ironman times. I’ll aim to have one long endurance ride in there. I consider that to be a minimum of 5 hours ride time, but have gone so far as 9 hours early in the year. An important part of this is that whilst I ride by feel I have the powertap in front of me and try to keep the power in my endurance zone. Typically after a couple of hours I find I feel good and my riding will pick up a lot. Route and terrain dictate difficulty and I’ll work hills reasonably hard. When alone they’ll be little to no stopping on this ride. Once I’m into the build periods I’ll certainly try to have mini-blocks of race pace in there. Remember though that Ironman race pace isn’t all out. Most of my other riding will fall into the 3 or 4 hour region with an occasional easy ride of only a couple of hours. When I’m feeling fresh I definitely try to keep the work rate up on these shorter rides. I like to do at least one deliberate hill session a week as a way to work at the top end of my power a little more. Hills or strong headwinds are great for my training as they don’t let me lose focus and go easy. Riding this much can be mentally draining so if I can arrange company for some of them I will. Who I go with can also seriously dictate the type of riding and sometimes it’s important to choose riding partners carefully! I’ve made mistakes here before! My key run session is unsurprisingly a long endurance run. I generally have a minimum of 2 hours for this with the occasional 2.5 hour run thrown in. I rarely go so far as to run 3 hours outside of races though. I wonder about the benefit of being able to train for that time, but so far have been too concerned by the risks. A 3 hour run in hot weather in Oz certainly put a lot of fatigue and extra recovery into one of my final build weeks prior to the Ironman. Key to the endurance run is I start slow, but build pace. By the end if the run has gone to plan I’m close to my Ironman race pace and very comfortable. The ideal is to arrive home feeling I could keep going! Outside of that run I’ll aim to have some kind of session most days. Often it’s just a very easy 30 minute run a little below Ironman pace. I’ve found very regular running has done a lot of good for my run strength and over time it’s felt a lot easier. My body seems to switch into running more easily even when feeling fatigued. On days with shorter bike training I’ll often up the run to an hour or so. Recently I’ve taken to adding in speedwork through short distance run races. With no taper to impact on other training I turn up and run a 20 to 40 minute race as hard as I can on the day. Sometimes it isn’t pretty! If I feel I need more run focus I may throw in two long runs in a week, one sorter than the other and normally spaced apart. Long runs always take place on days with short or easy bike sessions planned. Swimming is the tough one. I’m no fish and whilst not a terrible swimmer it doesn’t come easy. I’ve adopted a very volume focussed approach to swimming particularly with the facilities in the UK. Pools aren’t so good here, but I have access to a lake and can get a lot of work done there. Despite the volume approach some swim analysis and a weekly masters session have been key. The importance of technique makes coaching essential at least on occasions in the plan. A good squad swim is the best way to work some intensity into my swimming. Add to that the mix of strokes giving all round swim fitness. Currently all my other sessions are open water. The result is I’m incredibly comfortable swimming in my wetsuit and swimming continually for the Ironman distance. Outside of squad swimming simply getting in the water near enough daily is important to me. Working on good technique day in and day out until it starts to become second nature. As my comfort in the water has built I’ve added in endurance swimming sessions aiming to swim for anything up to 2.5 hours. I’d not necessarily advocate these as optimal Ironman training. the over-distance sessions give me greater confidence for the swim though. I aim to have at least one, but preferably two 5km open water swims a week now. These are non-stop continual swimming aiming to keep pace and turn over consistent. Always with good technique! Variability. Obviously the point of any training is to make the body adapt and become fitter. If you repeat the same thing over and over the body will adapt to cope with the stress. At some point thoug the stress needs to change or adaptations will slow and stop. The basic week is less static than it’s name implies. Sunday night I grab a scrap of paper, get a biro and scrawl out some notes and codes onto the back of it. After 5 minutes or so I have my next weeks training. When I draw the plan up I’m looking to place the key workouts to fit in best around any other events or activities scheduled. Whilst I’ll generally do the same workouts at the same sort of time, sometimes life gets in the way! Spacing of workouts aims to keep tough sessions apart to help allow recovery between them. Generally I work to a principle of trying to have two or three days that build up training load before an easier one. Volume or intensity are the routes to increasing training stress so a harder days sessions will consist of one or the other. I download training data into WKO+ so I’m able to track the training load for the week. The aim is to be building the Chronic Training Load over each build week with the easier days allowing some recovery to the Training Stress Balance. Whilst WKO+ works in exact numbers there’s a degree of interpretation to them. Sometimes if I’m just feeling good I’ll push that little bit more and others I’ll hold back. Sunday’s plan can get adjusted as the week goes on if reality isn’t living up to expectations. As I’ve mentioned though, keeping those key workouts is, well, key. All the time with these challenges I’m maintaining the general consistency of the plan and the key workouts. It’s hard to say if a given challenge contributes to improved performance, but at the least they keep things fresh. Both the routine running and the brick running were great for me. More from uping my run volume than anything else I suspect. The 8km swim was great mentally, but I think probably too long to be of specific Ironman use. You need to have a lot of time to train to make it worthwhile! Resting up. You may have noticed I made no mention of rest days in here. Planning on a weekly basis means if I feel a rest day is needed I can slot one in. I very rarely take total rest days, generally having easier training days to back off training stress a little. I’m well aware most programs out there are quite structured about having rest days or easier weeks. I prefer to take the rest and recovery when my body tells me it needs it. Personally I’m of the view that the body is constantly recovering, whether you’re training or not. The only difference is when you’re training the rate of breakdown can exceed the rate of recovery. Taking easier days where the body isn’t broken down too much gives some opportunity to recover, but helps keep adaptations developing. Sometimes, rarely, a full day off is needed though. Bringing this to a close my Basic Week is a weekly structured program assembling a collection of what I consider key workouts. Along with this I aim to be very routinely swimming, biking and running. Near enough daily for each of them. I focus on keeping the key workouts good above all else. Week on week the structure is similar or even identical. Changes occur over time to increase the training stress as I adapt or to focus on limiters. I’m confident that the result is greater fitness than I’ve previously achieved. At the same time I’m acutely aware that while I converted this to performance in Ironman Western Australia I’ve yet to do that this year. Which leads to tomorrow when I’ll be more critical and look at my mistakes and failures in the past year. There’s been a few!